The rapidly expanding shrimp aquaculture industry poses one of the gravest threats to the world's remaining mangrove forests and the communities they support. The leading consumers of shrimp (or "prawns") are the United States, Canada, Japan, and Europe. The fate of remaining mangrove forests may now rest in the hands of these consumers from wealthy nations which import these luxury shrimp products. 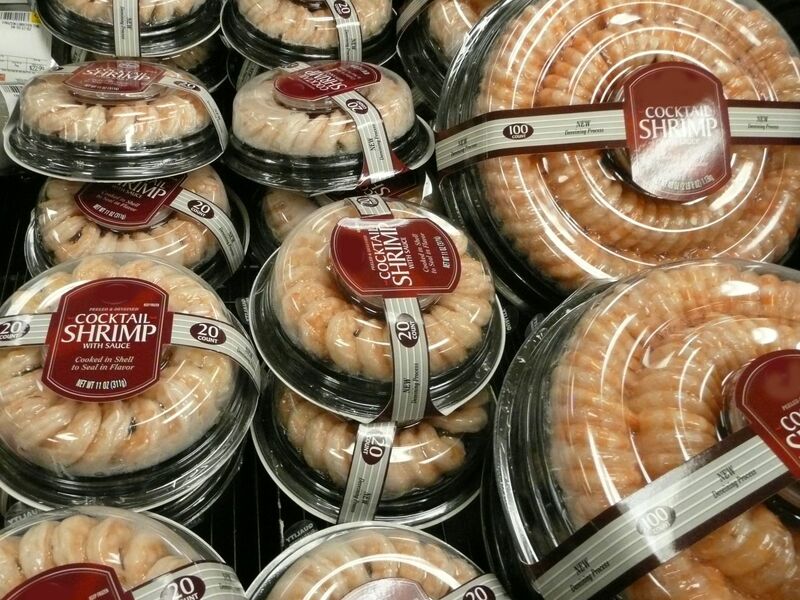 Since a highly profitable and expanding market is the driving force behind the shrimp industry, a worldwide reduction in consumer demand for farmed shrimp is called for. "To satisfy our demand for shrimp, thousands of miles of coastal habitats around the world often in developing countries have been destroyed. 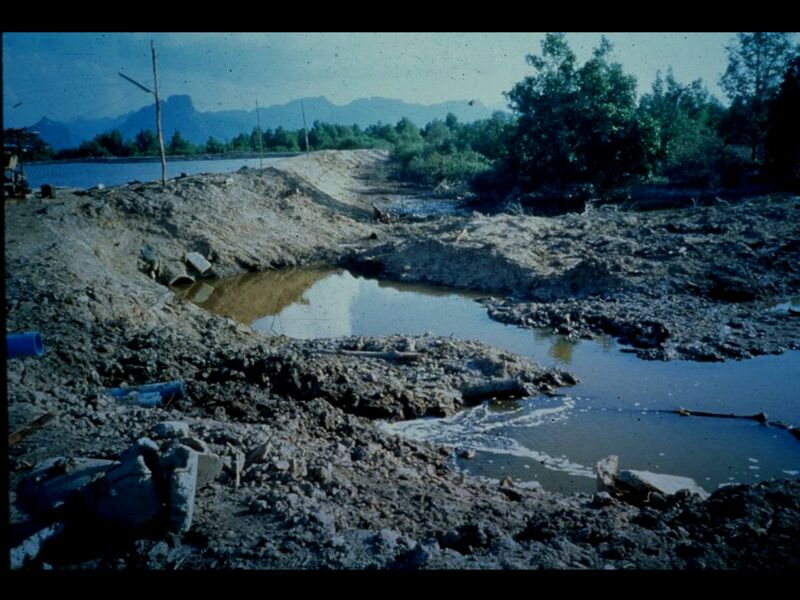 Forests and wildlife have been lost, and water and soil is polluted by shrimp farms. 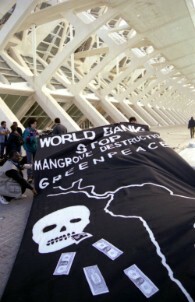 Protests by local communities have been met with threats, intimidation and violence." "In coastal shrimp farms, most of which are in tropical areas of the world, such as Ecuador and Thailand – disease can run amuck. The industry‚ solution is to dump tons of antibiotics to prevent the spread of bacteria and viruses. One widely used antibiotic, chloramphenicol, is banned in shrimp farming in the U.S. but is still used by many countries that export shrimp to the U.S. Chloramphenicol has been linked to human aplastic anemia (a lethal blood disorder), neurological reactions and other health problems. Unfortunately, the Food and Drug Administration, the agency responsible for ensuring food safety in the U.S., only inspects 1-2% of all seafood that comes across our borders; therefore, consumers may be eating these banned chemicals in their shrimp. Studies indicate that farm-raised fish contain higher levels of chemical pollutants than wild fish, including PCBs, which are known carcinogens. This is due to higher concentrations in the fish feed. Antibiotics are also a problem with farm-raised fish, directly affecting consumers by developing super strains of bacteria that are resistant to antibiotics, making diseases less treatable, and perpetuates the cycle of increased antibiotic use." Shrimp Cocktail of Chemicals Anyone? "If you’re on the hunt for a new diet trick to help you navigate the sea of holiday party menus on the horizon, you may want to consider cutting out shrimp. Do it and you’re likely to save more than just inches from your waistline: you’ll know for certain that you’re not slurping down a cocktail of harmful antibiotics and chemicals federal food inspectors have been finding in shrimp imported from south Asia. Recent sample checks on Thai imports have uncovered residues of antibiotics deemed illegal for food production in Canada and the United States. They’re also supposed to be illegal in Thailand, a global shrimp farming giant that pledged years ago to flush drugs out of its system, which yields 550,000 tons of shrimp per year. Although the Canadian Food Inspection Agency only scans a fraction of incoming seafood – five per cent is the agency’s target – inspectors are still finding tetracyclines (antibiotics commonly used to treat acne) nitrofurans (an antimicrobial drug and known carcinogen banned in Canada) and fluoroquinolones (broad-spectrum antibiotics used in human medicine) in the shipments they test. None should be consumed by humans." "In his book, Bottomfeeder: How to Eat Ethically in a World of Vanishing Seafood, Taras Grescoe paints a repulsive picture of how shrimp are farmed in one region of India. 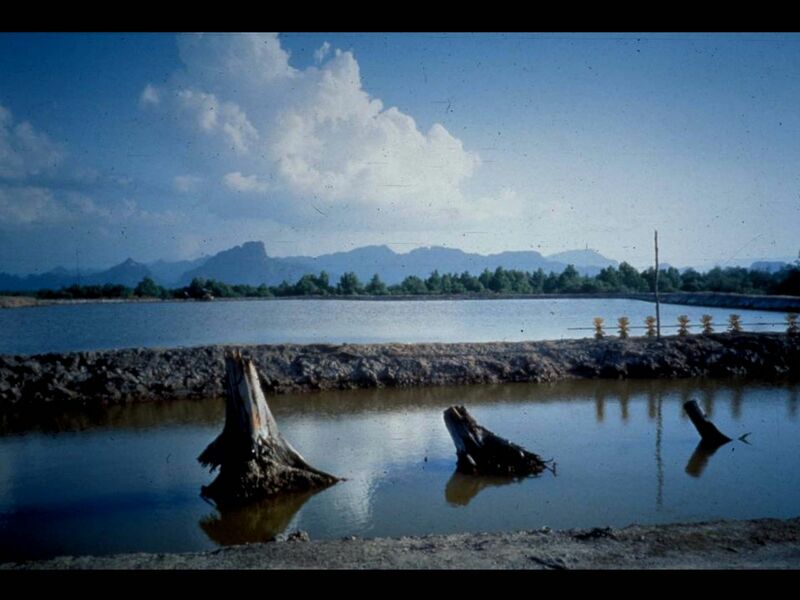 The shrimp pond preparation begins with urea, superphosphate, and diesel, then progresses to the use of piscicides (fish-killing chemicals like chlorine and rotenone), pesticides and antibiotics (including some that are banned in the U.S.), and ends by treating the shrimp with sodium tripolyphosphate (a suspected neurotoxicant), Borax, and occasionally caustic soda." "I stopped eating farmed shrimp (which is to say nearly 90 percent of the shrimp sold in this country) several years ago for three reasons. 1) They taste like ammonia or mud. 2) Too often, they are contaminated with drugs and chemicals banned by the United States government. And (3) Shrimp aquaculture is one of the most environmentally harmful ways humans have devised to raise food, contributing to the destruction of mangroves, pollution of coastal waters, and decimation of wild species."